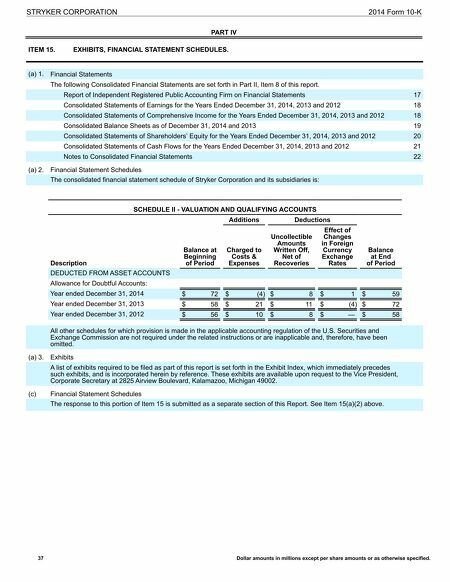 PART IV STRYKER CORPORATION 2014 Form 10-K 37 Dollar amounts in millions except per share amounts or as otherwise specified. ITEM 15. EXHIBITS, FINANCIAL STATEMENT SCHEDULES. (a) 1. Financial Statements The following Consolidated Financial Statements are set forth in Part II, Item 8 of this report. 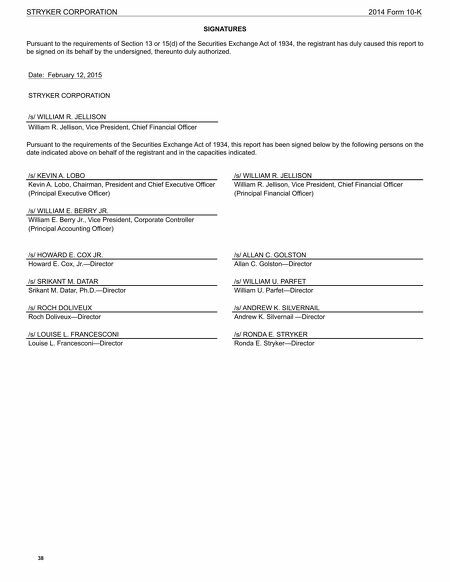 Report of Independent Registered Public Accounting Firm on Financial Statements 17 Consolidated Statements of Earnings for the Years Ended December 31, 2014, 2013 and 2012 18 Consolidated Statements of Comprehensive Income for the Years Ended December 31, 2014, 2013 and 2012 18 Consolidated Balance Sheets as of December 31, 2014 and 2013 19 Consolidated Statements of Shareholders' Equity for the Years Ended December 31, 2014, 2013 and 2012 20 Consolidated Statements of Cash Flows for the Years Ended December 31, 2014, 2013 and 2012 21 Notes to Consolidated Financial Statements 22 (a) 2. Financial Statement Schedules The consolidated financial statement schedule of Stryker Corporation and its subsidiaries is: SCHEDULE II - VALUATION AND QUALIFYING ACCOUNTS Additions Deductions Description Balance at Beginning of Period Charged to Costs & Expenses Uncollectible Amounts Written Off, Net of Recoveries Effect of Changes in Foreign Currency Exchange Rates Balance at End of Period DEDUCTED FROM ASSET ACCOUNTS Allowance for Doubtful Accounts: Year ended December 31, 2014 $ 72 $ (4 ) $ 8 $ 1 $ 59 Year ended December 31, 2013 $ 58 $ 21 $ 11 $ (4 ) $ 72 Year ended December 31, 2012 $ 56 $ 10 $ 8 $ — $ 58 All other schedules for which provision is made in the applicable accounting regulation of the U.S. Securities and Exchange Commission are not required under the related instructions or are inapplicable and, therefore, have been omitted. (a) 3. Exhibits A list of exhibits required to be filed as part of this report is set forth in the Exhibit Index, which immediately precedes such exhibits, and is incorporated herein by reference. These exhibits are available upon request to the Vice President, Corporate Secretary at 2825 Airview Boulevard, Kalamazoo, Michigan 49002. (c) Financial Statement Schedules The response to this portion of Item 15 is submitted as a separate section of this Report. See Item 15(a)(2) above.